My story, Selma of Soghut, from Ripples on the Pond , is in the March Edition of The Bosphorus Review of Books. Recently, Ray Not Bradbury https://raynotbradbury.com posted a review on Ripples on the Pond https://raynotbradbury.com/2018/06/25/book-review-ripples-on-the-pond-sebnem-e-sanders/ . I was pleasantly surprised to receive this review which she kindly posted on Goodreads, as well. I loved the photo of the book Ray took, which she used on her blog and on Instagram, and asked her if I might use it for a future post for Ripples. Scrolling through her blog, I discovered Ran Not Bradbury is a pen name for Victoria Ohlsson who lives in Sweden. So the picture was taken in Sweden by a Swedish reviewer. Well, this brought back some memories from many years ago, to be exact, fifty years ago, from 1968 . So, I time-travelled to the summer of 1968, when I spent about six weeks in Sweden, and a few days in Copenhagen. I was one of the Turkish students invited to attend an International Lions Youth Camp in Sweden. It was my first trip abroad and the Sterling Airways flight took me to Copenhagen where I boarded a train to Stockholm after making sure I was in the right car labelled Stockholm. When we reached the sea, the Stockholm labelled car slipped onboard a ferry. After arriving at the Swedish shores, the car was attached to a Swedish train. It was dark when we reached Stockholm. I entered the terminal in apprehension. How was the Swedish family I was to spend a week with before the Camp going to find me? Then I heard an announcement in English on the loudspeaker, calling my name and asking me to come to the Information Desk. A very blonde and blue eyed Swedish lady , Mrs Bernstrand, accompanied by two young boys with corn silk hair, greeted me with a smile. After dropping my small suitcase into the trunk of her car, she drove away to a destination unknown to me. I was very tired. I hadn’t slept since the early hours of the previous morning when my flight took off from Istanbul. The stress of finding the Copenhagen train station, buying the ticket, and making sure I was in the right car added to the tension. But the good thing was everyone in Copenhagen spoke English, even the dustman who guided me to the ticket booth. Although I had relaxed a bit on the train, the American sailors who boarded at the next station and tried to chat me up, gave me the creeps. As soon as I told them where I was from, they asked me if I had “Hash”. I was terrified. I clung to my handbag and my suitcase, praying they won’t steal my travel allowance of about 200 dollars in my wallet. I stopped talking to them, and luckily they went away. So trying to keep my eyes open and answer politely to Mrs Bernstrand’s questions was a hard task. I kept drifting off and waking up, thinking this is very rude. At the end of the journey, sprinkled with polite conversation, we came to a jetty and parked. A very tall and well-built gentleman, Mr Bernstrand, came to the car, and after greeting me, carried my suitcase and guided me to a motor-boat waiting at the jetty. Chloe was an Au Pair, taking care of the young boys in the summer. I think she was French, but spoke English. Kindly she offered me the bottom bed of the bunker. I collapsed and fell into deep sleep. I hadn’t slept for twenty-four hours. The cabin was equipped with a bathroom and shower. After the morning ablutions, it was time for breakfast. I emerged from the cabin and found myself in the middle of a pine forest. Birdsong filled the air, and the red house we were heading to was perched upon a hill facing the sea. We entered the kitchen with a magnificent sea view and sat at the generous breakfast table. Pickled herring Eww… No, I can’t have that for breakfast. It’s sweet too. I love the cheese though, and the crackers. And that little instrument that shaves the cheese. Ham, no problem. Coffee or tea, I can’t remember. Probably tea, I wasn’t a coffee addict, then, just acquiring new tastes. I loved the strawberries, though I couldn’t understand why they were pouring milk on them. Later I found out this was cream, not milk, though I still love my strawberries plain. I was at Varmdö, the biggest island in the Stockholm archipelago, where Swedish families spend their summers. An array of colourful wooden cottages sprinkled inside a pine forest where strawberries and raspberries grow wild, under the shade of the trees. No borders or hedges between the houses, a lifestyle without borders. I was lucky. The summer of 1968 was one the hottest summers in Sweden in thirty years. So, I took my first dip into the Baltic Sea and had a great time. The photos of Varmdö, from Google, exactly as I remember this gorgeous island. 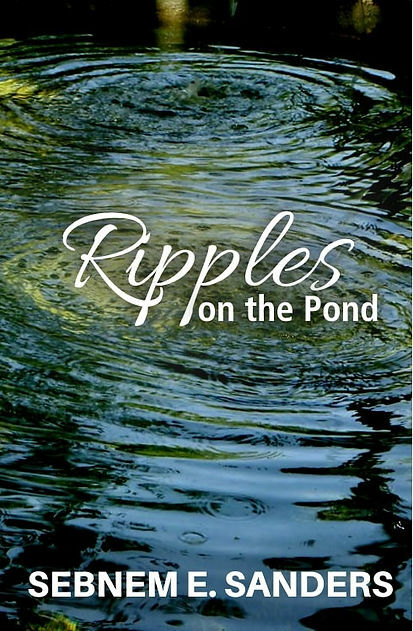 Many thanks to RayNotBradbury for reviewing Ripples on the Pond on her blog. I love her comments on the stories she chose to feature and analyze. I know I have been absent for a while, due to pre-election stress and anticipation, and post-election trauma and disappointment. Though hopes for a better future have almost diminished, life continues somehow. There is always something that puts a smile on our faces, despite the odds. This makes me think, perhaps, we tend to take life too seriously. At least, I do. I promise, I’ll be in touch more often, soon. Ripples on the Pond is a fantastic collection of over seventy flash fiction and short stories ranging in genre but all dealing with the human experience. From friendship to love to loss to tragedy, these stories are beautifully written. While reading, I found my heart yearning to travel to the places described and wanting to experience what the world has to offer. Like the title implies, each story is a ripple on the pond of life, extending its reach and revealing truth. Normally, I shy away from short story collections because I’m a novel reader but once I started reading Ripples on the Pond, I couldn’t stop. The writing is superb with its concise storytelling, yet I didn’t feel cheated by the length. Characters are fleshed out and given their moment to shine. When I finished and there were no more stories, I smiled to myself. This is one of those books I will be re-reading again and again. A must read! It’s wonderful to be mentioned in the Quartely Alumni Magazine of my Alma Mater, then ACG, The American College for Girls, now RC, Robert College, in Istanbul, Turkey.